The Legal Issues Committee of Georgian Parliament rejected the legislation regarding the “General Courts” proposed by Eka Beselia and 12 other Members of the Parliament. The proposal was backed by 3 deputies while the 5 rejected the legislation. The Independent MP, Eka Beselia, presented the amendment today in front of the Committee. The legislation outlines the criteria for the selection of candidates for the position of Judges in the Supreme Court. The legislation presents the fair and equal voting requirements, as well as the defined rules to be applied in the case of conflict of interests. The legislation also raises the subject of forming the working group on this topic. According to the legislation, in order to nominate someone for the position of the Judge in the Supreme Court they will need to have the support of not only the Judges but also non-judge members of the Court. The special working group will be completed with representatives of the Public Defender, Bar Association, NGOs and Scientific Circles. After the candidate nominated for the position gets the approval of the Supreme Court, the working group will then look into the appropriate candidates for the Supreme Court. After that, according to the legislation, the case will move on to the Legal Issues Committee of the Parliament. 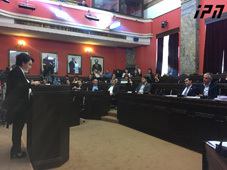 The Deputies that worked on this legislation alongside Eka Beselia, were Levan Gogichaishvili, Zviad Kvachantiradze, Gedevan Popkhadze, Beka Natsvlishvili, Irma Inashvili, Giorgi Lomia, Gela Mikadze, Emzar Kvitsiani, Ada Marshania, Nato Chkheidze, Gia Zhorzholiani and Mirian Tsiklauri. After the legislation got rejected by the Committee, Beselia spoke to the local media. The Independent Deputy said that the Legal Issues Committee was packed with the lobbyists for the Supreme Court of Justice and the “10-person list of Judges”. When speaking to journalists, Beselia said that ever since January of 2019 the Legal Issues Committee has lost its independence and is no longer capable of making the decision that will benefit the country. “Whoever voted against this change is a lobbyist. This isn’t unexpected and I was prepared for this.” Said Beselia. The Ruling Party, Georgian Dream stand by the claim that the legislation proposed by Beselia is not in line with the Constitution, therefore, it cannot be approved. One of the more controversial comments made by Beselia during the exchange between Beselia and the Committee was that Mikhael Chinchladze, The Member of The High Council of Justice had proposed the project singlehandedly to Irakli Kobakhidze, The Chairman of the Georgian parliament. According to Beselia, they were expected to give the life tenure to the judges that raised some questions. “This happened outside of the Constitution, through the Legal Issues Committee”. The independent deputy also said that the remark about the Secretary of High Council of Justice was made through the initiative of Mikheil Chanchladze as well. The process was led by the Chairmen of the Parliament and the comments and concerns from the Venice Committee or the Legal Issues Committee remained largely ignored. The members of the ruling party, Georgian Dream, responded to the events and claimed that Beselia’s bill has no future prospects and her comments are clear speculations. As Mamuka Mdinaradze, Majoritarian for the Georgian Dream, told the reporters, according to the proposed amendments the Justice Council will become the chancellery for the Court, the project is not aligned with the Constitution and the discussions regarding the legislation are a pure formality. “Parliament passed the draft law during the first hearing and we are expecting the conclusion from the Venice Commission. Therefore, it is impossible to discuss the support of the project that was presented. On the other hand, Beselia, as a lawyer, knows that this legislation has no real prospects” said Mdinaradze. 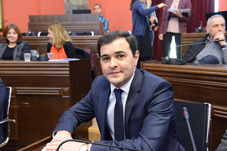 In the heated exchange between Eka Beselia and The Member of the Parliament Majority, Vano Zardiashvili, the Georgian Dream member denied Beselia’s claims that the remark about The Secretary of High Council of Justice was made according to the initiative of Mikheil Chinchladze. “We have never heard about this before. I won’t comment about Beselia, because people are tired of hearing about it. The Claims made by Beselia are absurd because no one person can make decisions regarding the Constitution. The right to nominate candidates for the position of judges belongs exclusively to the High Council of Justice and interference from any other government branch in this process is prohibited. This is the main principle of division of power in the Government. The goal of some media outlets is to keep Eka Beselia in the political field, but the society is tired of Beselia, " said Vano Zardiashvili when speaking to the reporters. Comments of the similar nature were made by the Member of the Parliament, Davit Matikashvili, who also denied the possibility of one single person being in charge of the constitution. The MP recalls the long working hours spent on the legislation together with the team that Beselia was a part of. According to Matiashvili, there was no subject that was discussed in private and every party interested was always fully involved in the process of constitutional discussions. In addition to that, the MP doesn’t recall Beselia having any objections when the legislation was discussed within the party. The members of the Georgian Dream Party see Beselia’s efforts as a way to gain political traction. The legislation proposed by Beselia envisages no less than 10 years of professional training for the candidate of the Supreme Court Judge. But as it was mentioned by various members of the majority it goes against the Georgian Constitution, more so that according to the constitution the Supreme Court Judge must have no less than 5 years of working in the field. However, despite the rejection, the legislative initiative will be discussed at the plenary session.